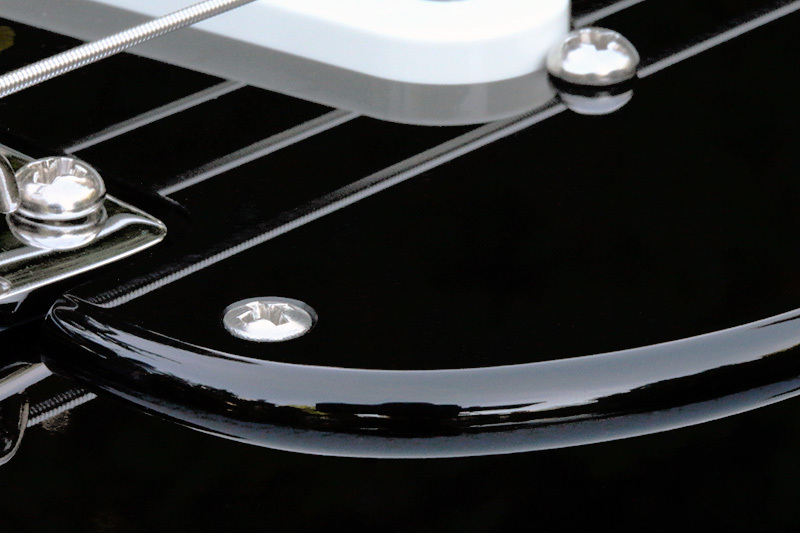 Close-up detail of the rounded and polished pickguard edge as depicted on a completed guitar. The rounded and polished pickguard edge is only available with the Black (or White) 1 Ply 0.120" Rounded and Polished Edge Acrylic pickguards. Pickguard - Your choice of one of the following four custom manufactured Left Handed 1 ply 0.120" Acrylic pickguards with the rounded and polished edge. Pickup and selector switch mounting holes are not countersunk and require round head mounting screws. Custom manufactured left handed stainless steel recessed mini-toggle switch mounting bracket. SPDT mini toggle switch for neck/bridge pickup selection modification. Left handed Black Strat® wiring diagram with neck/bridge pickup selection modification. You will receive this wiring diagram via email after order placement (when your order is invoiced). Each of our 1 ply 0.120” Acrylic pickguards with the rounded and polished edge are custom hand manufactured in our shop specifically for each customer. They start off being cut out of a sheet of Acrylic with a CNC laser which creates the basic pickguard shape with all holes and cutouts. We then create the pickguards round-over edge effect by hand with a router table where the pickguard is affixed to a routing template where we trim the pickguard to it’s final size and create the rounded perimeter edge. From there the pickguards rounded edge is hand sanded with a fine sandpaper to remove any tooling marks left behind by the carbide router bit. The smoothly sanded rounded edge can then be polished with a very soft canton flannel buffing wheel and a polishing compound used exclusively for Acrylic which creates the highly polished and glossy rounded edge. The pickguards perimeter mounting holes are then countersunk. It’s a fairly long process to create one of these unique pickguards specifically for our Gilmour style Black Strat® project, but we feel that final product is one that stands above the typical Strat® pickguard that have been produced the same way for over 50 years. This unique rounded and polished pickguard edge is only available on our Black or White 1 Ply 0.120" Acrylic pickguards. Pickup and 5-way switch mounting holes are not countersunk and require round head mounting screws. A significant feature of this kit is the recessed mini toggle switch. It's a unique feature that is synonymous with Gilmour's Black Strat. We manufacture our switch mounting bracket from a sturdy piece of custom formed stainless steel that is strong and easily mountable underneath the volume and tone potentiometers. It is not a permanent piece of the pickguard, but when installed becomes an integral part of it. The function of this recessed mini-toggle switch is to provide you with two additional pickup selection positions by adding in the neck pickup to the current selection of the 5-way selector switch. This includes the bridge and neck pickups selected together in parallel with one another which is similar in tone as a Telecaster and the second additional pickup selection is to have all three pickups selected together in parallel. All names used in this webpage are trademarked by their respective owners that do not endorse and are not associated with OverDrive Custom Guitar Works. Those trademarked names, manufacturers or individuals are used solely to identify the products of those manufacturers or individuals whose tones, sounds and visual similarities were studied during research, design and product creation. 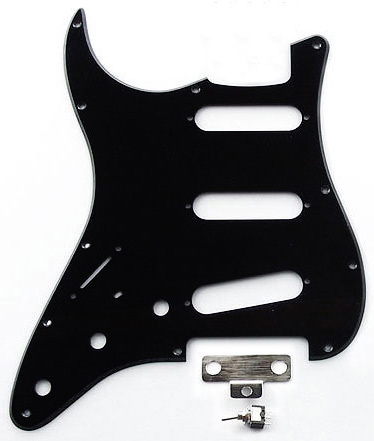 By purchasing this assembly kit you acknowledge that you are aware that some Strat® bodies are NOT 100% compatible and some pickguard perimeter mounting holes may need adjusting on your body. Each pickguard is custom manufactured for each customer and cannot be exchanged or refunded. This item is an assembly kit where you the customer are required to perform final assembly, wiring, soldering and testing to complete the kit. In the event you encounter an issue with the completed assembly we do not provide a troubleshooting service to assist you in figuring out what may have gone wrong. All parts included with any kit have been tested for fit and function prior to packing to ensure that everything will operate normally when the kit is completed correctly. You are required to have the necessary electrical, wiring and soldering skills/experience along with proper tools required to complete this project per the provided instructions. If you are not experienced with the required assembly, wiring and soldering and testing you will want to consult a trained professional to complete your project. Occasionally we find very small cosmetic imperfections in the surface of our Acrylic pickguards, typically they are small bubbles or spots and sometimes thin lines. This is not something we consider as defective since they are an effect of the Acrylic casting / handling process. Unfortunately we cannot determine if any Acrylic pickguard is going to have any of these imperfections until the entire pickguard manufacturing procedures are complete, so there is no way to pick and choose a "perfect" pickguard for a project beforehand. For the most part it's a non-issue and inconsequential and we will never let any pickguard go out that we feel has any undesirable characteristic that is obviously unacceptable. We've made over a thousand of these pickguards and some have these characteristics and no one has yet felt the need to complain. With that being said, we just felt it was best to make sure you were aware of these possibilities to avoid any surprises. Some import Strat's (MIM, MIJ), Squier's or "Look-Alike" Strat® bodies may not be 100% compatible with the pickguard perimeter mounting holes and some adjustment may be needed on your body. Our custom manufactured Acrylic pickguards have the exact same perimeter mounting hole pattern as genuine American Fender® Strat® pickguards, so as long your body mounting holes line up with those, then you should not experience any problem. Occasionally you may find the need to clean your Acrylic pickguard and the following are items you will need; an old clean and very soft 100% white cotton terrycloth towel or an old clean and very soft 100% white cotton T-shirt, pressurized air can and an Acrylic cleaner such as Novus #1 "Plastic Clean and Shine" or Kleenmaster Brillianize, DO NOT use any other cleaning products to clean the Acrylic pickguard or you may damage it. On occasion you may wish to remove some fine scratches from an Acrylic pickguard or back plate and the Novus #2 "Fine Scratch Remover" is the perfect 1'st step cleaning product choice for this task followed up with Novus #1 or Kleenmaster Brillianize. For world-wide distribution and Acrylic cleaning product availability contact the manufacturers directly at Novus or Brillianize.